NDP leader Jack Layton, in his bid to replace Stephen Harper as prime minister of Canada, says he is humbled but determined by a groundswell of NDP support suggested by the latest popularity polls. As of Wednesday, an Angus Reid poll showed the New Democrats riding atop all other parties in Quebec — with 38-per-cent support — 11 percentage points ahead of the Bloc Quebecois. Apr. 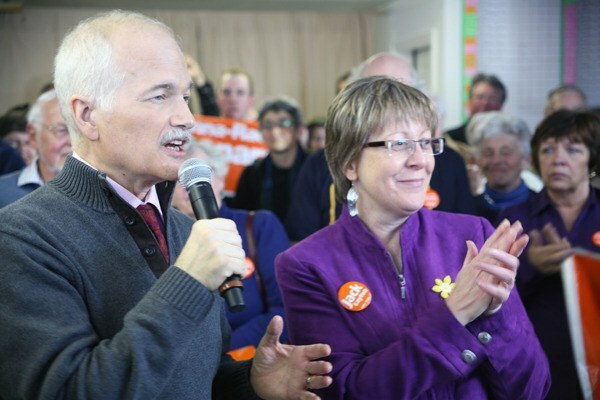 28, 2011 2:00 p.m.
Jack Layton was in the Comox Valley earlier in the campaign to support Vancouver Island North NDP candidate Ronna-Rae Leonard. The poll had the NDP at 30-per-cent support, second only to the Conservatives, who were at 35 per cent. An earlier CTV News/Globe/Nanos poll shows NDP national support at 23.6 per cent, the Liberals at 25.6 per cent and Harper’s Conservatives at 39.2 per cent. An Ekos poll has the NDP in second place behind the Tories. He feels the service record of Vancouver Island North NDP candidate Ronna-Rae Leonard, a member of Courtenay council and chair of the Vancouver Island Regional Library Board, will contribute to that process. “Ronna-Rae will be a voice for the North Island in Ottawa, instead of the other way around — Ottawa’s missive to the people of the North Island telling them what’s good for them,” Layton said in reference to incumbent Conservative MP John Duncan, whom he chastised for voting to impose the harmonized sales tax without consulting the people of B.C. Along with Leonard, Layton speaks highly of Nanaimo-Cowichan MP Jean Crowder, Nanaimo-Alberni candidate Zeni Maartman and Victoria MP/deputy speaker Denise Savoie. These include a national housing strategy, a nine- to 11-per-cent small business tax cut and a Post-Secondary Education Act. The latter would ensure college and university education is affordable and of high quality, and kept public and non-profit. “The level of student debt is so high that many students are having to abandon their studies,” Layton said. Retirement security is also an NDP priority. The party wants to double Canada Pension Plan payments in a step-by-step process over several years. “If we don’t start now, we’re going to find in a few years, and already this is happening to some people, they can’t retire,” Layton said. “We want seniors to be able to be comfortable. They’ve earned the right. If the HST is voted down in the coming referendum, the NDP says British Columbians should not have to pay back the $1.6 billion “bribe” offered by the Tories. From Winnipeg, Layton’s campaign trail stopped in Edmonton and Yellowknife en route to the Island. Canadians go to the polls Monday.